We are proud to announce a new certification option for Blackboard faculty at SHSU. Participants who complete the Multimedia in Blackboard Courses fully-online faculty development course will receive the “Multimedia Master” certification. This fully-online certification course provides the Blackboard instructor with the knowledge and skills in both the acquisition and implementation of multimedia for online/face-to-face and hybrid courses. Technologies and best practices are examined in the context of student engagement and success. Finding, placing and crediting images in Blackboard courses. Finding and placing YouTube videos in Blackboard courses. Finding and placing NBC Learn content in Blackboard courses. Using Kaltura CaptureSpace Lite to place audio, video and screen captures in your Blackboard course. Adding interactive video quizzes to your Blackboard course using Kaltura. Best practices around using multimedia in your Blackboard course. The course will begin on June 1st and is a self-paced course, though we encourage you to interact with those colleagues who are in the course with you. 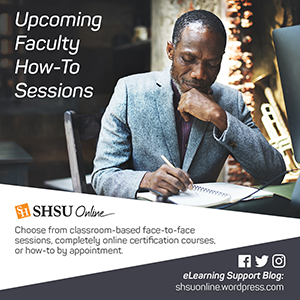 Visit the SHSU Online Faculty Development How-to Session page to sign up. Course content is found in each module in a sequential format using a Blackboard Learning Unit/Module tool. Course content opens in new tabs for easier reading. At the end of each learning unit, participants will have the opportunity to download module contents via a PDF file link. Course activities can be found within each module of the course. Activities take place as a student in the Multimedia in Blackboard Courses course and as in instructor in the Multimedia Practice course that you will be added to upon enrollment. Total time investment: 10-12 hours. Take a look at the Multimedia in Blackboard Courses syllabus for more information. Visit the SHSU Online Faculty Development How-to Session page to sign up. June is a great time to pursue upgrading your LMS technology acumen. SHSU Online has development opportunities that can help in this pursuit! Attend one of the face-to-face how-to sessions. Sign up for one-on-one sessions. These sessions can be 5 minutes to an hour and can take place in your office, ours, over the phone and online. Use the same link to sign up for face-to-face or one-on-one sessions. Just select a topic or come up with one of your own and we’ll do it! Multimedia in Blackboard Courses: This fully-online certification course provides the Blackboard instructor with the knowledge and skills in both the acquisition and implementation of multimedia for online/face-to-face and hybrid courses. Technologies and best practices are examined in the context of student engagement and success. Participants can choose to complete all module activities for this course and receive a Multimedia Certification or just complete any of the modules that interests them, a la carte. Blackboard Collaborate – The Ultra Experience: Synchronous collaboration in Blackboard just got a whole lot easier. Introducing Blackboard Collaborate – The Ultra Experience. In real-time, share audio, video, chat, files, whiteboard and software applications on your computer with your classmates and instructor. No java plugin needed! Collaborate Ultra runs inside your Internet browser! Session lasts approximately 60 minutes. ProctorFree – Online Proctoring for Blackboard Exams: This one hour session covers how to use ProctorFree for your online exams & quizzes in Blackboard. ProctorFree is an on-demand, automated online proctoring service that deters cheating in an online testing environment. Using bio-metric and machine learning technologies, ProctorFree has eliminated the need for a human proctor during testing. This innovative technology creates a convenient testing option for distance education students and increases the credibility of online certificates and degrees for higher education institutions. Kaltura – Lecture Capture in Blackboard: Adding video to our Blackboard course just became easier! This 60-90 minute session covers how to add video to your Blackboard course using the Kaltura Mashup tool. Attendees will learn how to record and upload video from their webcam as well as capture what is on their own computer screen (PowerPoints etc.). Blackboard & More – By Request: This one hour session is scheduled for SHSU Blackboard instructors who can’t quite make it to Huntsville. An SHSU Online Blackboard export will be at the Woodlands Campus to help answer questions, provide solutions, demonstrations and more around Blackboard and interfacing software applications.